quarrygirl.com » Blog Archive » not so fast, morningstar farms! gardein to the rescue! Does Ralphs sell a variety of Gardein stuff? I hope Gardein takes over the Crumbles, if that’s the case! @marcus: ralphs does sell a variety of stuff! they have vegan buffalo wings, faux chicken stuffed with daiya, and tons of other stuff! i am not sure about vons…but ralphs definitely does. Trader Joe’s also sells Gardein “beef” and “chicken” strips under the TJ label. 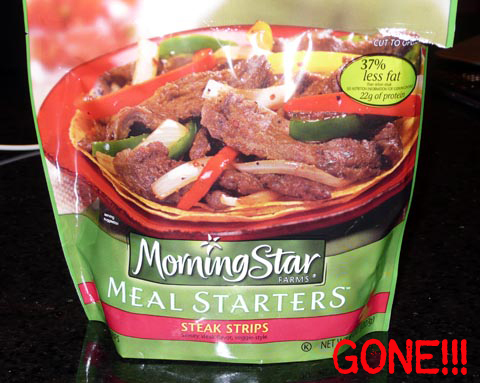 i never ate morning star stuff. but i’m gonna eat this tips! i wonder what’s up with the riblets. mmmmm riblets. I love the beefless tips! They go great in anything. also found three other new Gardin products in the vegan section of Whole Foods 3rd & Fairfax over the weekend. A Santa Fe Chicken, BBQ skewers and shredded beef to use on sandwiches. These were the only Gardin products they carry though so you’ll still need to hop on over to Ralph’s for the others. I live in Port Hueneme and am trying to find inexpensive Morningstar Farms’ products that don’t cost an arm and a let. Last Friday 11/13/09 in desperation,I picked up a package of M.S. burgers at $5.25/package! I think I saw this new product which isn’t a lot cheaper at Ralphs on Channel Islands Blvd. I will try TJ in Ventura next time for M.S. 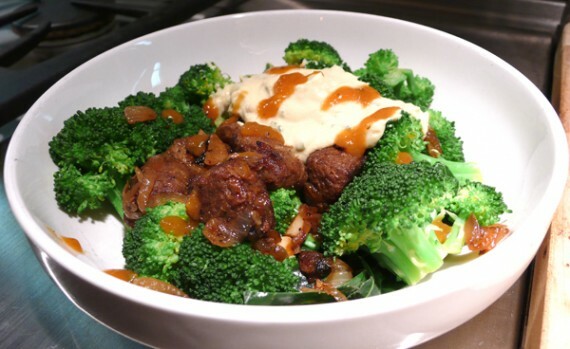 Make your own fake meat. Less than $2 for 3 pounds. 5 minutes work, 60 minutes baking time. Love these – and I’m not a vegetarian or a vegan. They taste so freaking good! I have been looking for meat alternatives since starting Weight Watchers and I gotta say these are the BEST ones out there. I like Boca Crumbles and burgers, but I LOVE these. They are pricey, but totally worth it. They have a good mouth feel and they are tasty as all get out. I was lmbo at the “Yes, hell yes!” I could feel the excitement through the screen lol! 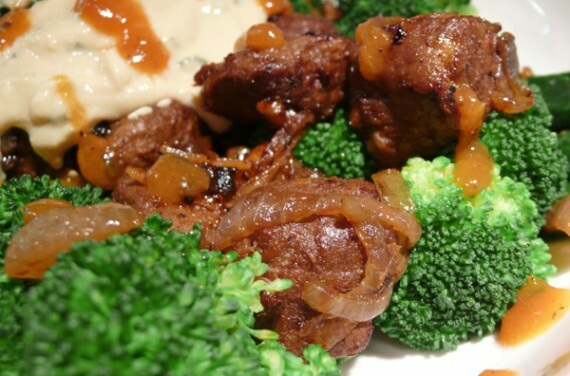 I tried the beefless skewers, but haven’t tried the tips yet. I’m guessing they taste fairly similar. I just tried the scallopini for the first time today and LOVE! I tried the crispy tenders first and wasn’t overly impressed so I was a bit leery of the other products. I was pleasantly surprised with the skewers and the scallopini. 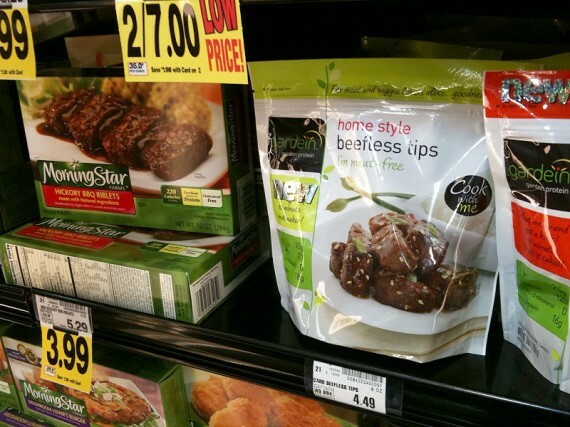 WOW, I had no idea that Gardein made the original morning star faux meat strips!! That’s super interesting! I’d rather give my $ to gardein any day! 😀 Very cool!